It’s been a while since I’ve wanted to send a letter bad enough to actually buy a stamp. But these new space stamps might finally make it worth it. The United States Postal service released a new set of Forever space stamps today at the once-a-decade World Stamp Show (yes, a real thing). 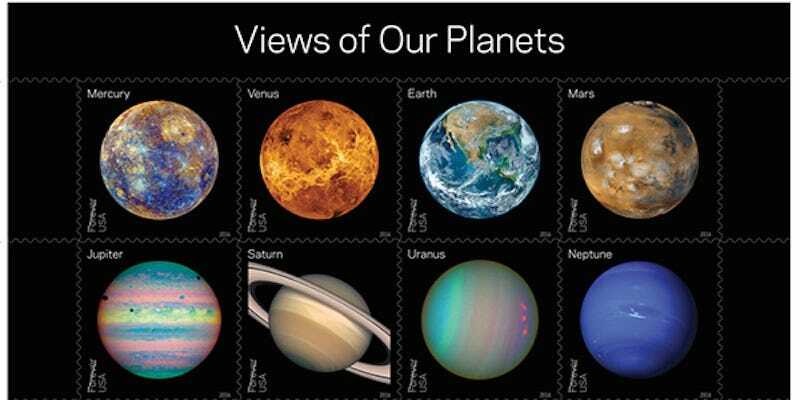 The stamps, featuring closeup portrait views of Mercury, Venus, Earth, Mars, Jupiter, Saturn, Uranus, and Neptune, are so lovely that they seem almost wasted on an envelope. Particularly exciting is that not-quite-a-planet Pluto also made it into the fold. Although it’s not included in the planet book, it has its own special edition commemorating the successful New Horizons missions. It was especially notable because the New Horizons mission took one of the last Pluto stamps issued—a 29 cent stamp entitled Pluto: Not Yet Explored—aboard when it blasted off. That stamp was issued back in 1991, when Pluto was still as planet and postage was 20 cents cheaper. The new book Pluto—Explored! is a callback to that original. These aren’t the only space-themed stamps we’ll be seeing soon. The USPS also plans to release a series of Star Trek Forever stamps. The vintage-themed stamps will celebrate the 50th anniversary of the show this year. Although the exact release date hasn’t yet been released, here’s a view of what we can expect. They’re so good that they make all kinds of craziness—sending a letter, say, or even taking up stamp-collecting—sound remarkably plausible.